This gentle mist not only helps address the itch and flaking associated with Psoriasis, but helps encourage cell turnover and soften skin. Won't leave hair or skin greasy or oily. Great used along with the oil or balm. Mist on clean skin and then apply a light layer of either over top. I offer several products for both Psoriasis and Eczema, but it is important that you understand the difference between the two and why I offer multiple solutions for one problem. Psoriasis = Itching + Flaking (typically larger plaques) + Redness + Cracking Skin with Redness and / or pain. Psoriasis is an immune-related skin concern, and so cannot be "cured" topically. That being said, if you have Psoriasis, you would probably be happy with having it under control and not painful. Bear's Beauty Psoriasis solutions are designed to be used individually or layered together. I used a combination of fruit acids (to soften + encourage cell turnover + slough off dead skin) and Organic Willow Bark to soothe redness and calm in all of the Psoriasis formulations. Essential Oils are carefully blended into a synergistic mix that smells fresh and herbal, but dissipates quickly. 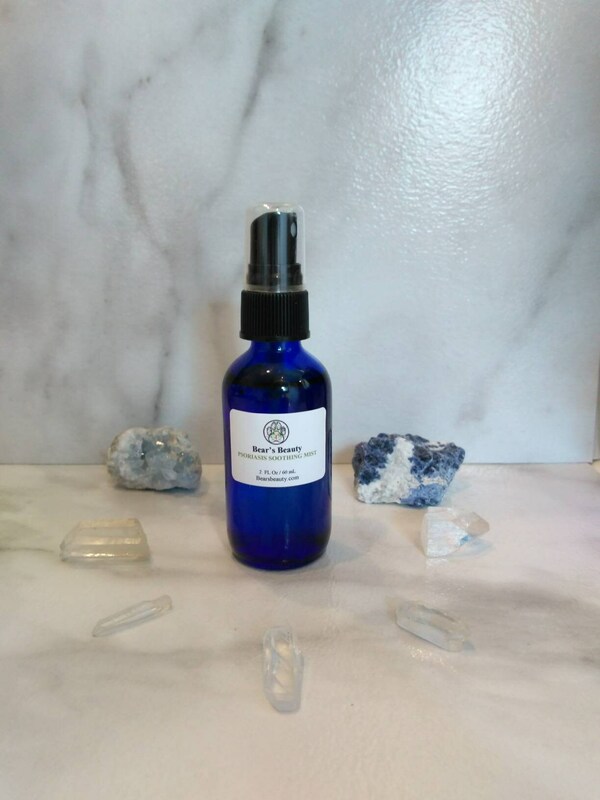 If you have sensitivities to Essential Oils, the Body Serum can be made without them, via spacial request. Weather you struggle with Psoriasis or Eczema, anytime you cleanse your skin or get wet, you should be applying some type of oil-based moisturizer. Keeping the skin protected and the lipid layer intact is one of the most important steps to healing your skin. Things like commercial lotions that use emulsifying wax literally emulsify your own skin's oil and rinse it away down the drain, leaving your skin even drier than before. Bear's Beauty products are meant to only do good. Each ingredient nourishes and encourages your body and the natural processes involved in healing. Soothes itch + Reduces Inflammation + Moisturizes without leaving hair or skin greasy + great for use during the day. I have been working on an oil-free version of my Psoriasis Balm / Oil for quite some time now. I wanted it to have the same soothing benefits of the Oil and Balm without leaving hair greasy or weighed down. This spray is exactly what I wanted, and I think you will love it too. Organic Aloe Vera makes up the bulk of this spray. Aloe moisturizes without being sticky or oily + soothes + speeds healing + reduces inflammation. Organic Coconut Water : Coconut water is not just for drinking anymore. Nature’s perfect hydrator also happens to be amazing for your hair and skin. Rich in Vitamins A + C as well as Anti-Microbial Lauric Acid. Unlike Coconut Oil or Milk it does not contain any fatty acids, so it moisturizes without being oily or clogging pores. Contains protein, cytokines, responsible for encouraging cell growth and activation. Helps to regulate the PH of the skin as well as keep it moisturized. Rich in antioxidants that help reduce things like dark spots + scars + sun damage. Rich in Vitamin K + Iron it helps strengthen hair and encourage healthy scalp. Quinoa Protein strengthen the hair shaft and add shine. White Willow Bark is a natural source of Salicylic Acid. White Willow Bark helps to speed cell turnover + antimicrobial + gently exfoliates dead skin cells and plaques without irritating + smoothes + unclogs blocked pores. Organic Glycerin and Provitamin B offer nourishment and help to moisturize and soothe irritated skin. Proprietary Essential Oil Blend that includes Manuka + Tea Tree + Tamanu Oil to help reduce inflammation and irritation, soothe itch, and reduce flakes. Mist onto scalp, ideally when hair is dry. Scalp should be damp, but not soaked or dripping. Use fingers to gently massage into scalp. Great for use on days you don't want to wash your hair, or right after washing your hair.